es, you read it correctly. 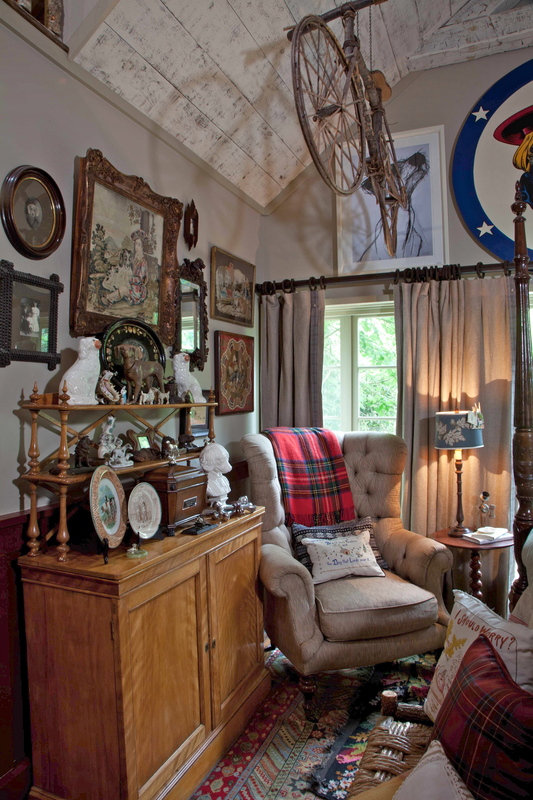 This room is casually referred to as the “Dog Room” by homeowners Bill Cook and Michael Faust. A charming collection of dog-themed items–placed masterfully, of course–create a sense of warmth and welcome. 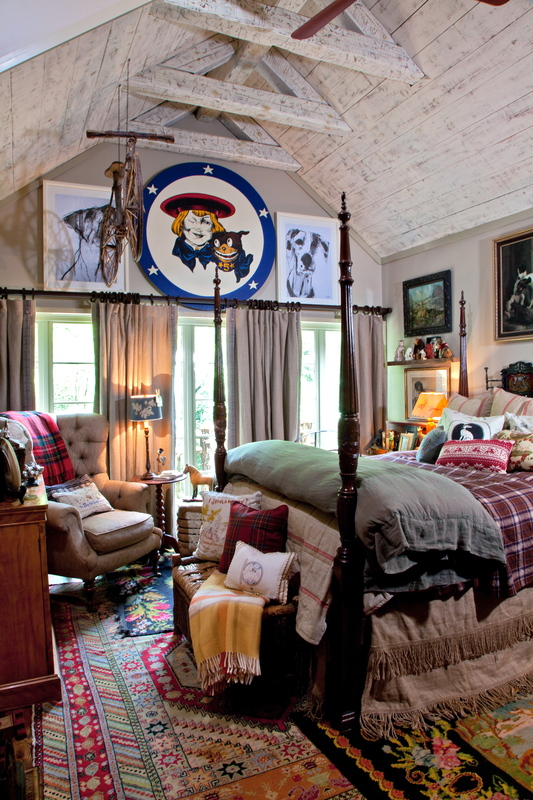 The room is layered in dog paintings, ceramics, needlepoint and dog friendly fabrics. How lucky the guest who has such a welcoming spot! And as you look at the photos, don’t miss the charming loft–another inviting space to steal away. To top it off, I’ve added photos of the side porch … and now we’ve covered it all. I hope you have enjoyed the tour of this amazing home. Do you feel the challenge yet? It’s time to start re-arranging our rooms! Buster Brown welcomes you to the guest room. I love the way the rugs are layered–don’t worry if they are the wrong size, just add one more! The Cozy corner chair and blanket invite lazy days. 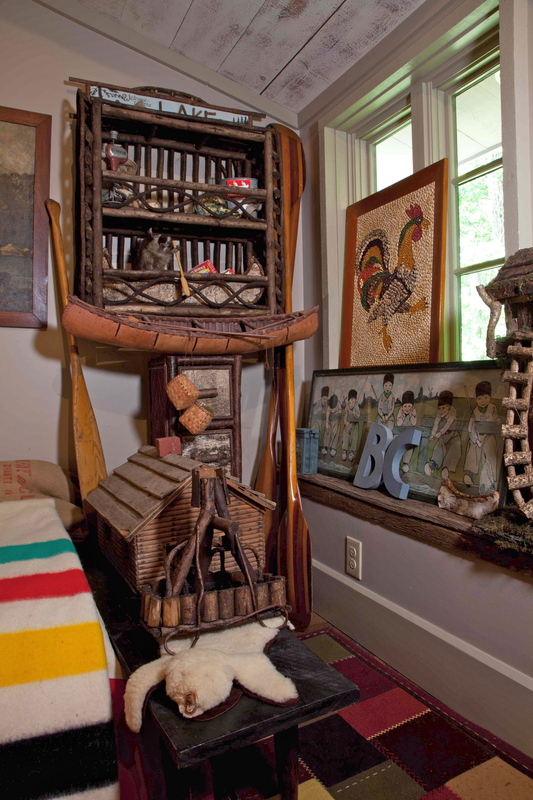 The display of the collections is masterful–every inch is a learning experience. 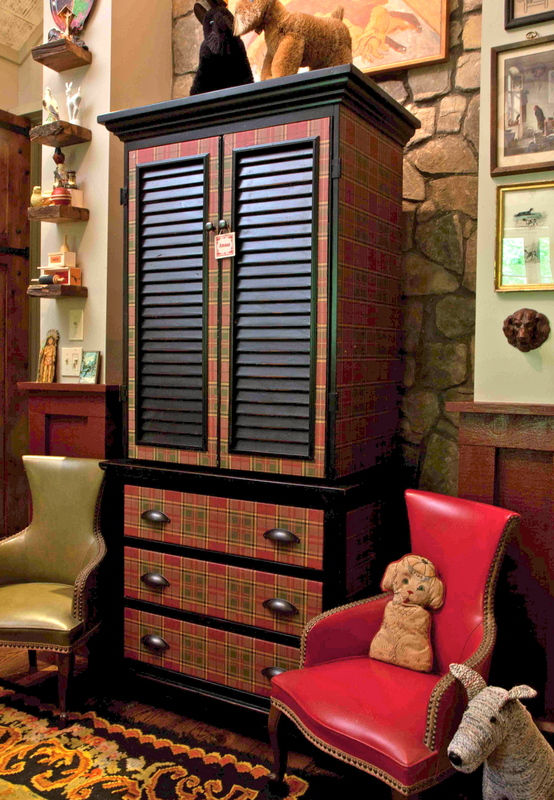 This Tartan chest provides storage and a little Scottish flair to the room. The small leather chairs are just too charming for words. The small door on the right leads to the most amazing loft. Hurry up the window lined stairs. 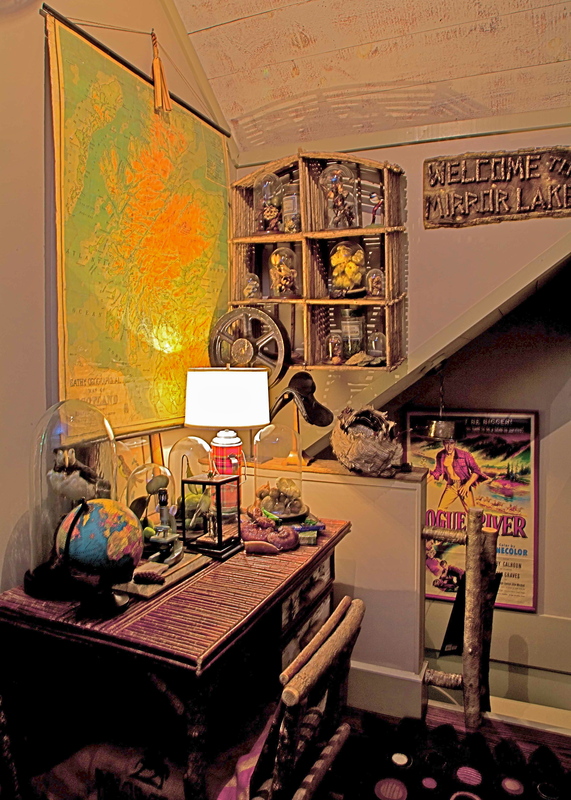 A small desk is tucked in near the stairs. Imagine being able to work here–or hide! 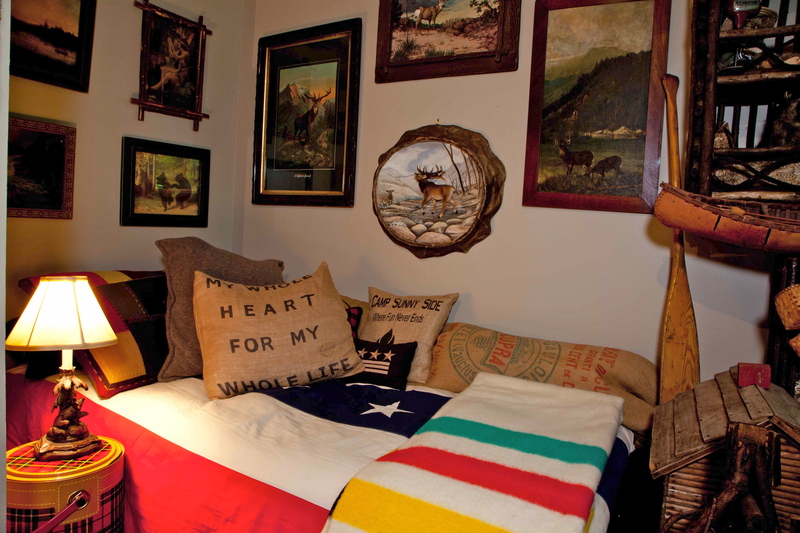 A small daybed covered by a Pendleton blanket awaits the adventurous guest. Deer and bear prints line the walls. Arrangement ideas are everywhere in this small loft. The log cabin and canoe are great details for a mountain lake house. 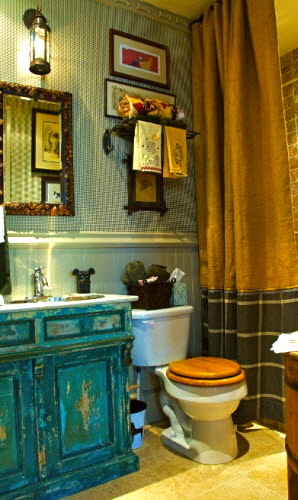 The bathroom contains the dog theme, too … notice the ‘dog bone’ detail on the crown molding. How beautiful is that turquoise vanity! The side porch is perfect for entertaining. 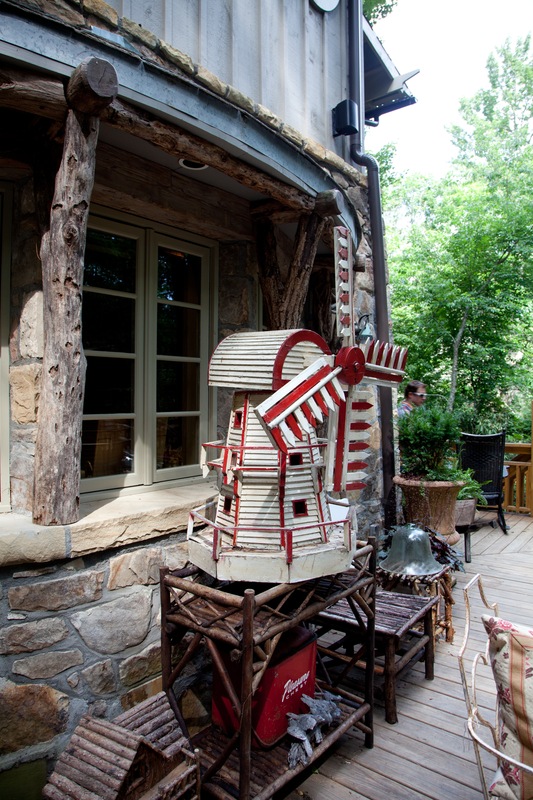 The windmill has moved outside anticipating summer. 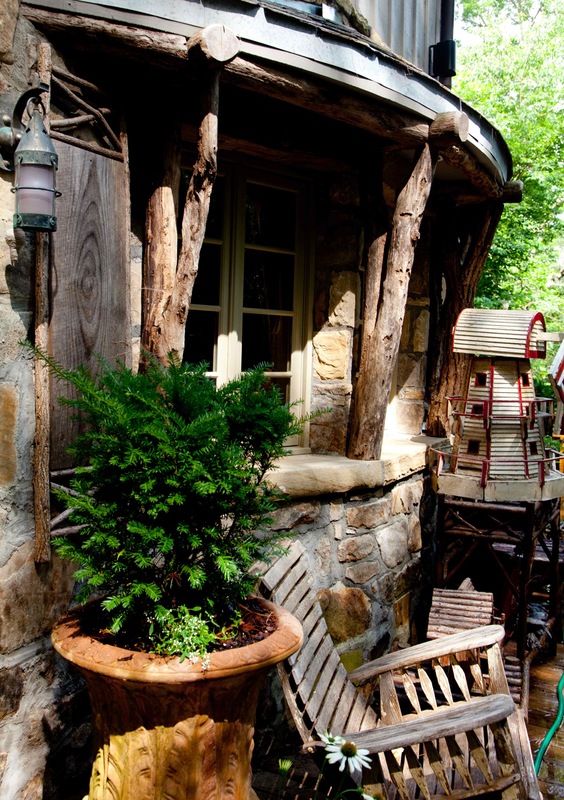 The stone walls, casement windows and locust log details add interest and charm to this side porch. Dinner under the stars overlooking the lake would be wonderful here. I would never leave too. 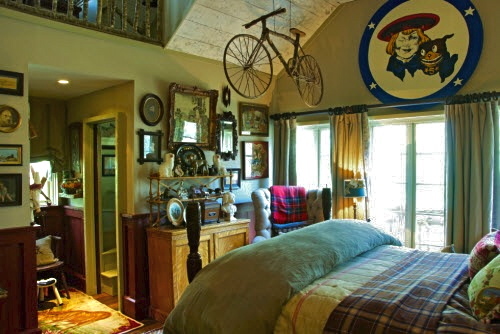 The whole house is just the most charming thing ever. This whole tour has been fascinating! The amount of thought and detail put into the decor is just amazing! Cindy, I could spend hours just finding new ideas!